Pros: Each of the four pieces was short enough to leave you wanting more. Radically different styles and themes kept the night interesting. Cons: A break between each piece and a late start made the event longer than it needed to be and quality varied in writing and acting. 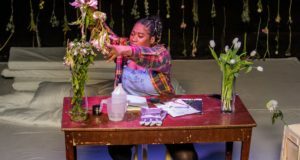 Our Verdict: A thoroughly enjoyable, casual evening with an active feedback process for the writers, though it was far from polished work and not for everyone. This would mainly appeal to theatre people familiar with the development process. 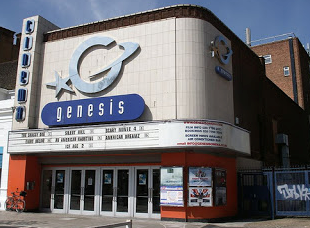 Genesis New Writing Night takes place in an independent East London cinema’s upstairs bar. With a small, brick walled stage and a vintage stand mic for the actors and wonderfully comfy couches for the audience, the evening was very relaxed and casual. The cinema’s owner introduced the evening and explained the format, which was a highly personal touch. I can’t think of a time where I’ve seen the owner of a building introduce a show inside it. His presence and participation truly shows he cares about the venue’s programming. Each audience member was given a feedback form for each piece in order to contribute on the shows’ development. The actors had a day’s rehearsal so wore no costume and had scripts in hand. The first piece, Guilty, used the bar as the stage. Benji (Stephen Papioannou), a bad boy bartender with a “not guilty” tattoo on his arm flirts with Alice (Aislinn De’Ath). She fancies his bad boy image and he regales her with gangland tales. As they get more intimate, Alice rubs off the eyeliner tattoo and in a panic, we learn that Benji is a Jack Whitehall-esque posh boy who slums it for posh girls who like a bit of rough. Alice leaves the bar as Lisa (Emma Stirling) arrives, and the cycle starts again. There were some well-timed comedy one-liners and the writing was tight. The performances reminded me of a classic film such as Grease: stereotypical, stylised, over the top and from another time period, but the script contains contemporary references. The performance style would work if it matched the script, and were designed in a vintage style. As is stands though, the whole piece felt more like a short sketch in a comedy show rather than an excerpt from a complete play, and I struggle to see how this would develop into a full-length performance. The next piece was Handcuffs. A police officer (Nieve Hearity) waits in a hospital with Wayne (Ben Crawley), for him to be seen for a possible broken arm. Wayne is in handcuffs and spends most of the duration trying to negotiate his release from them. The officer just wants him to sit down and shut up. We hear a litany of excuses: they hurt his arm, he needs a cigarette, he doesn’t have his methadone. He then resorts to bribery, then threats. The officer does not buy into any of it and maintains a professional detachment. Wayne comes across as a fully developed person with ideas and opinions and his manipulation tactics show he’s more than a strung out junkie. Crawley captures this well. When the officer eventually snaps and threatens him with more bodily harm, Wayne does indeed sit down and shut his mouth. The writer gave us very human, developed characters that I cared about and wanted to see more of this piece. This one had excellent potential. Fame Fatale, the third piece, was a biting satire of contemporary celebrity-obsessed culture with a large cast. A nameless celebrity musician (Stephen Papaionnou) lounges onstage with his girlfriend constantly massaging his shoulders and his manager (Mark Joseph) at his side, moaning about how hard his life is. Three gossips/fans (Emma Stirling, Ben Crawley, Aislinn De’Ath) move around the room loudly sharing gossip and opinions on various celebrities. At the end of the piece, a girl comes in (Nieve Hearity) asking for the celeb to listen to her music. He rudely insults her and blows her off, and the piece ends. This wass another one where I struggle to see how this could be developed into a full-length play without becoming repetitive, even though it was a well-executed and well-performed comment on this aspect of today’s society. One Foot In the Playhouse was the best and last play of the night. Eighteen year old Rich is played convincingly by Emma Stirling as meeting with his writing mentor, David (Mark Joseph). Rich is a London estate kid, David is an accomplished, educated middle-aged playwright. An unseen but often mentioned producer drives this meeting. Rich is resistant to Mark’s “posh” feedback; he finds Rich’s characters unbelievable but Rich swears they are like that in real life. 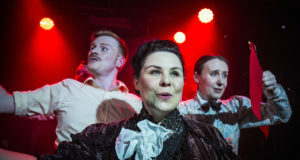 Themes of ageism in the arts and the class system are prevalent but not overbearing as the worlds of the two characters clash in pursuit of a common goal to get Rich’s play ready to produce. This was the most advanced of the four pieces and the best performed. An enjoyable evening, but it ranged in quality of writing and performance. I applaud the commitment of the venue owner and staff to the creation process of new work. As with any new writing showcase however, quality is inconsistent. Genesis New Writing Night runs at Genesis Cinema on the third Thursday of every month.